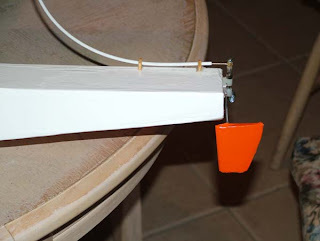 Jay McMullan's RC Aircraft Blog: My Float Plane is Ready!!! This has taken much longer than I had planned. I had these styrofoam floats and I started fiberglassing them to go on my .60 size Tower Hobbies trainer. Well, I don't know if you have ever fiberglassed an airplane before but it is a major pain. Every time I do this, I swear I'll never do it again. It just gives such a beautiful finish once it is done. In this case, with the floats being styrofoam, I really wanted to make them stronger, especially when I sit the plane in the grass to start it. I don't want little sticks poking holes in the bottom of the floats. To fiberglass the floats, just like an airplane, I started with finishing cloth that is like less than one ounce for a yard of material. It is VERY light and thin but strong. You cut the cloth and lay it on the sides, the top and the bottom all separately and brush on epoxy resin. 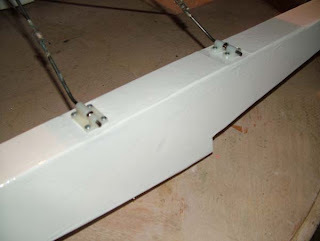 When I fiberglass balsa, I like to add just a little alcohol to thin the epoxy. I've heard stories that too much alcohol and the resin will never harden. I use regular 30 or 45 minute epoxy from the hobby shop and it is almost too thick to use without being thinned. With the foam, I can't use alcohol because I'm afraid it will melt the foam. You can buy "finishing resin" which is usually a polyester, two part, resin. 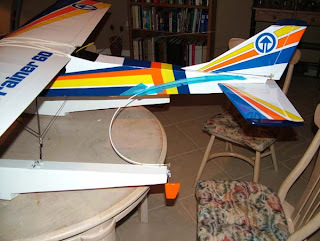 I've heard that polyester tends to shrink a little as it cures but I doubt it would be any problem with an RC plane. After I got the cloth and resin on the floats, I decided the top and bottom of the floats needed to be a little stronger so I put 3/4 ounce cloth on them. I left the sides with just the finishing cloth. I had originally thought I would go ahead and paint the floats but by this time I am sick of the whole fiberglassing process so I decided to use Monokote on them, on top of the fiberglass. My belt sander made quick work of sanding the resin. When using paint on a fiberglassed surface, I sand until the surface is as smooth as I can get it without cutting through the cloth. Then I shoot the part with primer. Once it is dry, I sand it almost completely off, leaving it only in the low spots. I may repeat this step three or four times, however long it takes to get the fuselage smooth and without imperfections. Then I shoot the paint. I think I just don't like finishing planes. I want to fly them so badly, I don't have the patience to get through the finishing step. I had a buddy in Salt Lake City that could work miracles with Monokote. I've never seen anything like it. I admire people like that that have so much patience! I got all the Monokote on the floats today and decided not to put any decorative stripes on them. It is almost 2 am and I am just finishing up. The fancy stripes can can wait! I used nylon nose gear blocks to mount the axles and they are going to work great. 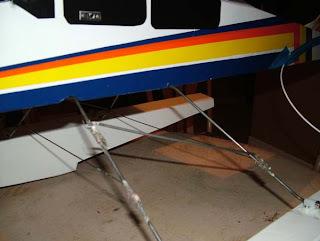 I also made separate landing gear wires for the floats. I was originally going to use the main gear in conjuction with the floats but changed my mind. I am using a flexible cable for the water rudder. It is permanently attached to the floats but I am going to tape it to the side of the fuselage so I don't have any permanent brackets on the fuse. I will see how that works. I am seriously thinking about flying her tomorrow. It will be cold in the morning but afternoon should not be too bad. I'll let you know how it goes!